Patients who have lost a significant amount of weight either through dieting or bariatric surgery often find it difficult to rid themselves of the extra skin left behind. Where on the body this extra skin occurs, and to what extent, depends not only on your body type, but also the quality of your skin and supporting tissues. Since many areas of the body can be affected, there a number of procedures that can help. Typically, Dr. Kent treats the chest and abdomen first, followed by the arms, thighs, and face. A complete correction may take several stages, but this is something Dr. Kent will go over with you in detail during your consultation. 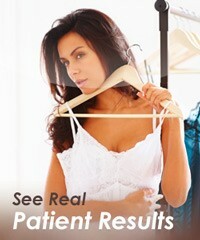 A Breast Augmentation, Breast Lift, or a Breast Reduction depending on the situation. A full Abdominoplasty is usually needed for weight loss patients. Occasionally, a circumferential body lift is required where the tummy tuck incision is taken completely around the body so that the excess skin of the sides and flanks is more effectively lifted as well as the buttocks. An arm lift, or Brachioplasty, removes the excess skin from the upper arm, although taking it further onto the lateral chest considerably improves the results in the arm as Dr. Kent is able to remove more skin close to the armpit and then taper the excision out onto the chest. This is the most difficult area to treat, and results are highly dependent on how close the patient is to his or her ideal weight. Sometimes, Dr. Kent will liposuction the thighs first, and then perform a thigh lift several months later after the swelling from the liposuction has resolved and the tissues have completely healed. A Facelift, Brow Lift or eyelid lift (Blepharoplasty) may prove beneficial. All of the procedures above can be performed as an outpatient at a surgery center, although sometimes staying overnight as an inpatient is preferred. Pain and recovery time vary by surgery. Please contact our office with any questions or for more information.